Don't you love release day Tuesdays? 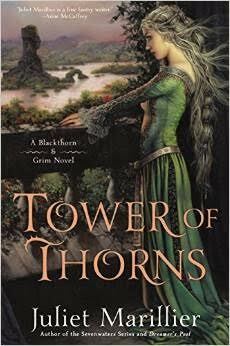 Today is the release of the second book in Juliet Marillier's Blackthorn & Grim series—Tower of Thorns. In the acclaimed Dreamer’s Pool (Roc Hardcover; 2014), award-winning author, Juliet Marillier, introduced readers to Blackthorn, an embittered healer escaped from prison, and her former cell-mate, the hulking and silent Grim. Fleeing to a derelict cottage on the fringe of the mysterious Dreamer’s Wood, Blackthorn and Grim must live duty bound for seven years to assist anyone who asks for her help. Now, in TOWER OF THORNS (Roc Hardcover; $26.95; November 3, 2015), a noblewoman from the northern border has asked the Prince for help in expelling a howling creature from an oldtower on her land—one surrounded by an impenetrable hedge of thorns. Casting a blight over the entire district, and impossible to drive out by ordinary means, it threatens both the safety and sanity of all who live nearby. With no ready solutions on hand, the Prince must consult Blackthorn and Grim, who put the pieces of the puzzle together, discovering that a powerful adversary is working behind the scenes. Now their quest is about to become a life and death struggle—a conflict in which even the closest of friends can find themselves on opposite sides. In honor of release day, Penguin Random House was so kind as to offer up a brand new hardcover to one reader! This giveaway is open to those with U.S. mailing addresses. To enter, simply fill out the Rafflecopter. The giveaway will be open through Tuesday, November 10th.